This Fiber U course is designed help you learn how to prepare cables for termination or splicing, then terminate, splice and test them. 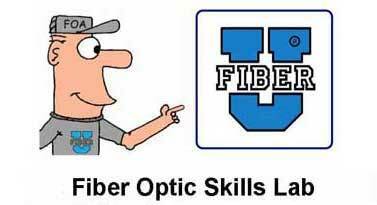 To get the most out of this course, the “hands-on” exercises, you should have some knowledge of fiber optics or have completed the Fiber U Basic course already, so you know the “jargon” and all about the basics of fiber optics. Begin by reviewing the lesson plans in the following pages. It will give you an overview of what you will be doing in each section and help you organize your work. You will want to follow the same procedure with each section: 1) watch and/or read the reference material, 2) set up your equipment for the lab and 3) do the hands-on exercises. It helps to watch the videos completely at least once. You will probably find it convenient to have them ready to play while you are doing the hands-on exercises or you can use the VHO (Virtual Hands-On) links. They will show you step-by-step how to do the exercises using the processes we have gotten from manufacturers and instructors as well as have developed in our own labs. It is very important to follow the steps in order to properly complete the exercises. Work in a space where you will not be disturbed and avoid distractions. It is important you concentrate on the exercises and follow each step carefully. Allow plenty of time to complete the exercises without interruption, especially termination. During the termination exercise, you will use adhesives which must be used quickly. This splicer has his safety glasses on, is working on a black mat to help see the fibers and has a trash bin handy. 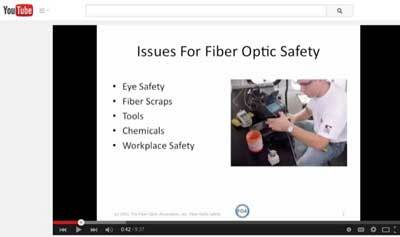 Do not work with fiber without safety glasses and a proper work area that is easy to clean up. It is recommended to not work on carpeted areas because fiber scraps can become imbedded in the carpet and be difficult to find and remove. A pair of safety glasses must always be worn. Use them, keep them clean, and protect them from damage like any other tool. 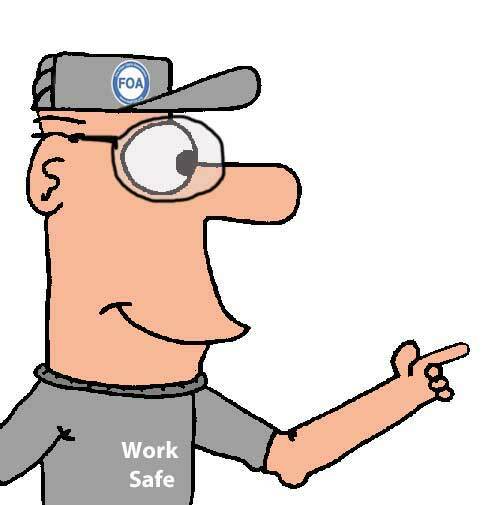 You must always wear safety glasses because you will generate fiber scraps that may fly through the air and land anywhere. If scraps get into your eye, you will be making a visit to the local hospital emergency room. The broken or cleaved ends of fibers are extremely sharp and can easily penetrate your skin! Be careful to not stick the broken ends into your fingers, since they invariably break off and are very hard to find and remove. Most times, you have to wait for them to infect and painfully work themselves out. A pair of tweezers are included in the kit for removing splinters. Carefully pull the glass splinters out before they have a chance to break off and become lodged in the skin. Avoid these painful accidents by exercising a little caution. Dispose of all scraps properly. Keep a piece of double stick tape on the bench to stick them to or put them in a properly marked paper cup or other container to dispose of later. Do not drop them on the floor where they will stick in carpets or shoes and be carried elsewhere. Do not eat anywhere near the work area.